A while back Windows introduced this concept of public networks and private networks. Basically it comes down to a question of "do I mostly trust this network?" However, it's never been totally obvious how to change this back and forth. There's lots of posts on the internet explaining how, but most are pretty complex with a lot of steps. 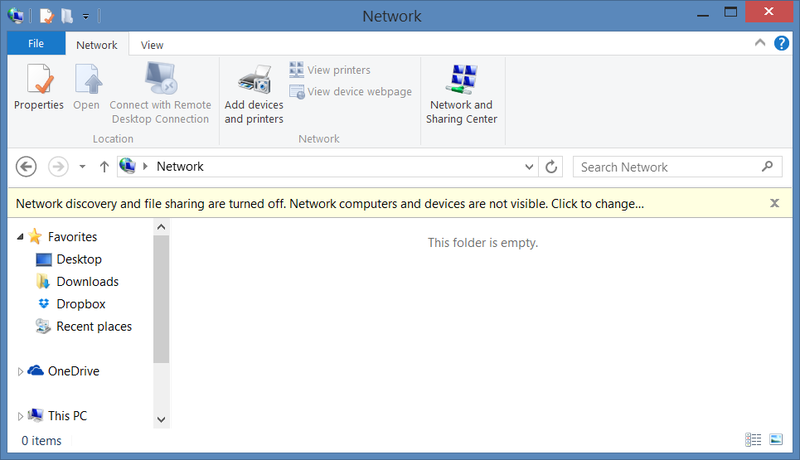 The most common reason to want Windows to treat the current network as a Private Network is so you can have someone connect to your machine, either share files over SMB, or connect via Remote Desktop (RDP). I hit this issue probably once a month where I can't figure out why I can't see this machine over Remote Desktop, and it's because it thinks I'm on a Public Network. One technique is to go to Network within Windows Explorer and try to get this yellow bar to show up. Clicking on it will give you a choice that isn't clear to Non-Technical Family Member. No is the right answer, always. But this is a bad dialog because it looks like a Sophie's Choice. You WANT to treat THIS NETWORK - the one you are on - as a Private Network. Select No. Press the Windows Key + W to search Settings. Turn "Find PCs and Content" to ON. This Network is now a Private Network. Don't believe me? Bring it up side by side with the Classic Network Center and watch it switch back and forth in real-time! I hope this helps you out as much as it did me! On my Surface 3 Pro running Windows 8.1, I'm not seeing that option under the metro network settings for my wireless connection. Jon - What do you see? Thanks. I always wanted to know how to change this. My daughter pressed "yes" on her MacBook the other day. Guess I need to change this back now. Find the network. Category 0 = public, category 1 = private. To those not seeing the option. 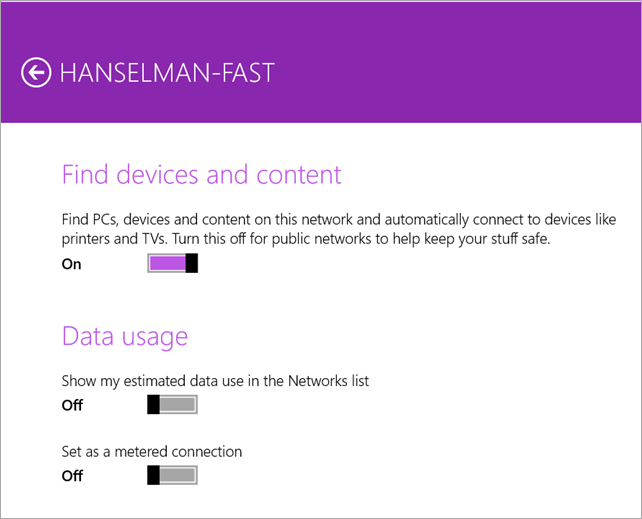 This option is not located in the Network flyout (Settings Charm, Network), but in the PC Settings app. Wow, thanks! I have considered private/public network //maybe// valuable but a pain to administrate. Do you have a HANSELMAN-SLOW? Sorry for ranting, but... You'll need a Windows 10 version of this post in a few months. It will likely be completely different yet again for no apparent reason. There's no more Win+W anymore, for example... because... nothing. The UX around the entire network stack has been aggravating since Vista and with each release, they shuffle the deck again. The Modern/Classic split personality crap has only gotten more and more annoying. If you're like me, 90% of the time when you're looking for ANYTHING network related, it's the classic TCP/IP v4 properties dialog. WIN+X,W is the fastest way I've found to get to where XP would take you. Commit it to memory so you can untrain/retrain yourself something new in a year when it moves again. Please note that the option will not appear when your User Access Control (UAC) level is set to "Always notify." In this situation you will need to use the registry editor or lower the UAC level to change the network type. Very impressive article Thanks alot for screen shots it will prove very helpful for the readers of the article. You have done great job. Now a days it is very necessary for a business to keep its important data save. You have solved the problem by posting this blog.keep it up. Oh man, that is what I needed from MSFT and Verizon and they could not figure it out. Patent this and send it to them.... Great. Glad I found your site and this info. Now... what about that HIDDEN network that shows up?